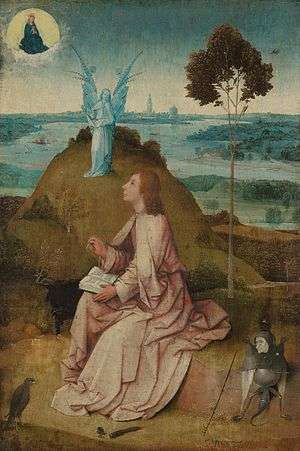 John of Patmos (also called John the Revelator, John the Divine or John the Theologian; Greek: Ἰωάννης ὁ Θεολόγος) is the name given to the author of the Book of Revelation, the apocalyptic text forming the final chapter of the New Testament. The text of Revelation states that the author is called John and that he lives on the Greek island of Patmos, where, by some, he is considered to be in exile as a result of anti-Christian persecution under the Roman emperor Domitian. Traditionally, the writer of Revelation is widely considered to be John the Apostle, who is also seen as author of the Gospel of John. However, others identify the author as John the Elder and many modern scholars believe it was written by an otherwise unknown author, to whom they have given the name John of Patmos. The author of the Book of Revelation identifies himself only as "John". Traditionally, this was often believed to be the same person as John, son of Zebedee, one of the apostles of Jesus, to whom the Gospel of John was also attributed. 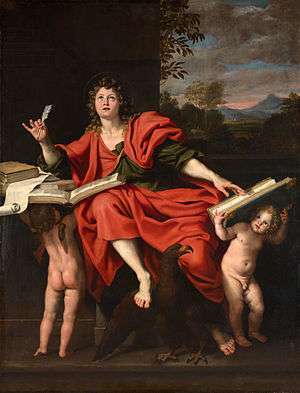 The early 2nd century writer, Justin Martyr, was the first to equate the author of Revelation with John the Evangelist. Other early Christian writers, however, such as Dionysius of Alexandria and Eusebius of Caesarea, noting the differences in language and theological outlook between this work and the Gospel, discounted this possibility, and argued for the exclusion of the Book of Revelation from the canon as a result. The assumption that the apostle John was also author of the Book of Revelation is now widely rejected in modern critical scholarship. The early Christian writer Papias appeared in his writings to distinguish between John the Evangelist and John the Elder, and many biblical scholars now contend that the latter was the author of Revelation. ↑ Phillips, J. B. "Book 27 - Book of Revelation". 12 January 1962. People, Places, Customs, Concepts, Journeys - the New Testament with integrated notes and maps 1962. ↑ Ben Witherington, Revelation, (Cambridge University Press) page 2. ↑ Ehrman, Bart D. (2000). The New Testament: A Historical Introduction to the Early Christian Writings. New York: Oxford University Press. p. 432. ISBN 0-19-515462-2. ↑ Larry Hurtado, Lord Jesus Christ: Devotion to Jesus in Earliest Christianity, (William B. Eerdmans Publishing, 2003) page 49.